My husband and I have a soft spot for all things Italian. So when Lindsay of Cucina Famiglia approached us about a giveaway, we asked if we could design something extra special just for her. Of course she agreed (grin). This was the original proof. It was so much fun, I could hardly be reined in. And I don't know how she was able to choose just one! (I couldn't have) But narrow it down she did and we created a lovely design for her; visit the giveaway post to see which one. Lucky for you (and her readers), someone will get their very own Cucina Famiglia wall quote design for his/her kitchen and one more lucky winner will get a $50 gift certificate to use to their heart's content at WallQuotes.com. Check out Lindsay's review/giveaway post at Cucina Famiglia and enter to win. Best of luck; and watch out - with all her great homestyle recipes and lovely photos, you might just find yourself spending more time in the kitchen - yum! **P.S. 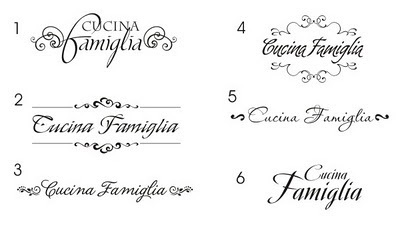 - If you want one of these cucina famiglia designs for your own kitchen, please contact us - we'd love to help infuse a little italian love into your cooking space.